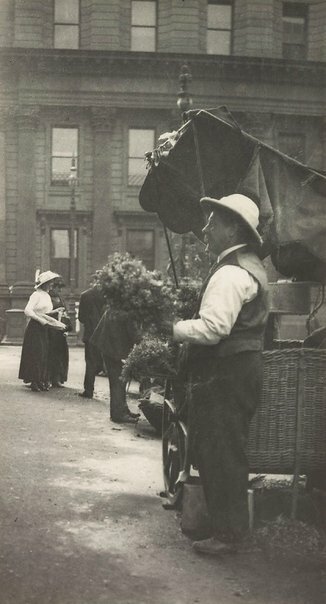 Flower sellers feature in multiple images within Cazneaux’s oeuvre, most commonly those which lined the thoroughfare of Martin Place. This picture was taken further down the business district, toward the Quay, in Macquarie Place. Its focus on a lone seller typifies what Francis Ebury describes as Cazneaux’s gravitation toward romantic visions of humble city dwellers 1. While international pictorialists were writing in journals such as ‘The Amateur Photographer & Photographic News’, about the suitability of the urban slum scene to the pictorialist aesthetic, Cazneaux’s subject preference remained diverse 2. He shot children around the slums of The Rocks, as well as workers, and pedestrians against the regency architecture of the inner city.